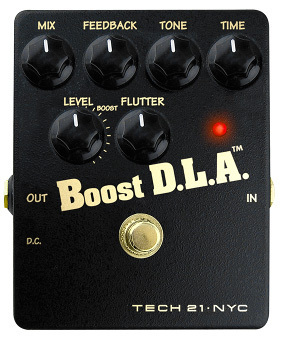 Boost D.L.A., Delay/Echo/Phrase Sampler for Guitar from Tech 21. 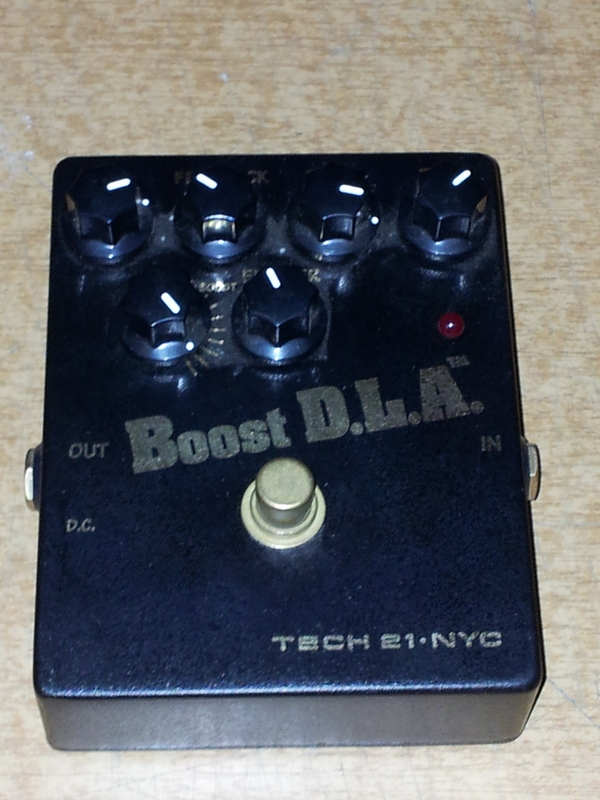 Product replaced by the Tech 21 Boost D.L.A. Tap Tempo V2. 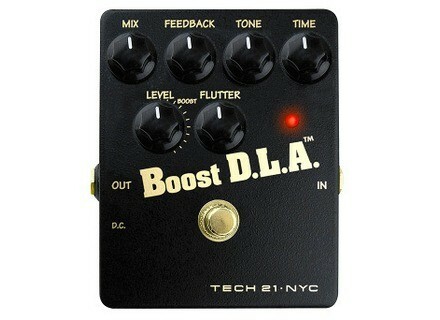 The Boost DLA from Tech 21 is a boost and delay pedal in one. It offers around 1000 ms of delay and a healthy amount of volume boost. It’s a sturdy pedal with an all metal chassis metal footswitch and metal jacks. The bypass switch is a soft switch style and the pedal requires 9 volts of power. Controls allow you to change the decay of the delay, the time of the delay, the mix of the delay, the amount of boost, and the amount of modulation or “flutter” as they call it on the delays. 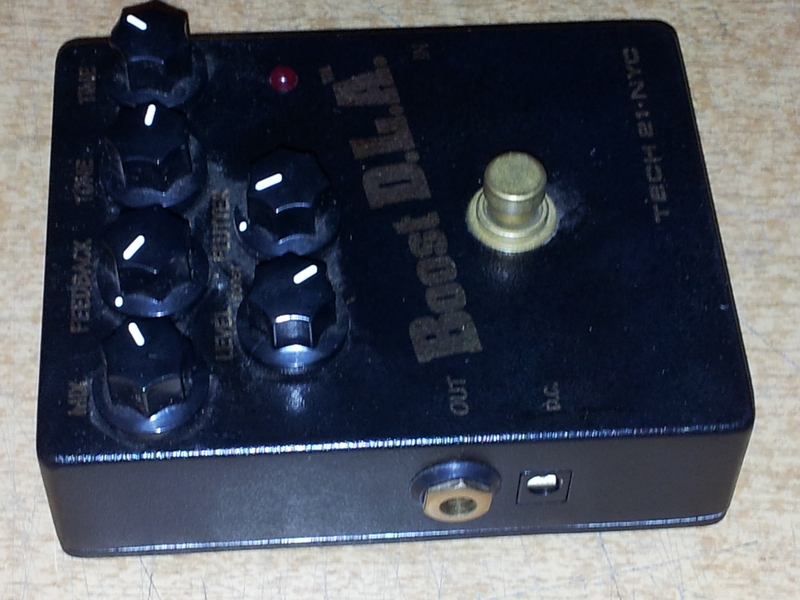 You can set the pedal as a boost or as a basic delay, but boost and delay are not available separately via footswitches. The idea behind this pedal is great; it’s the perfect solo pedal for me. 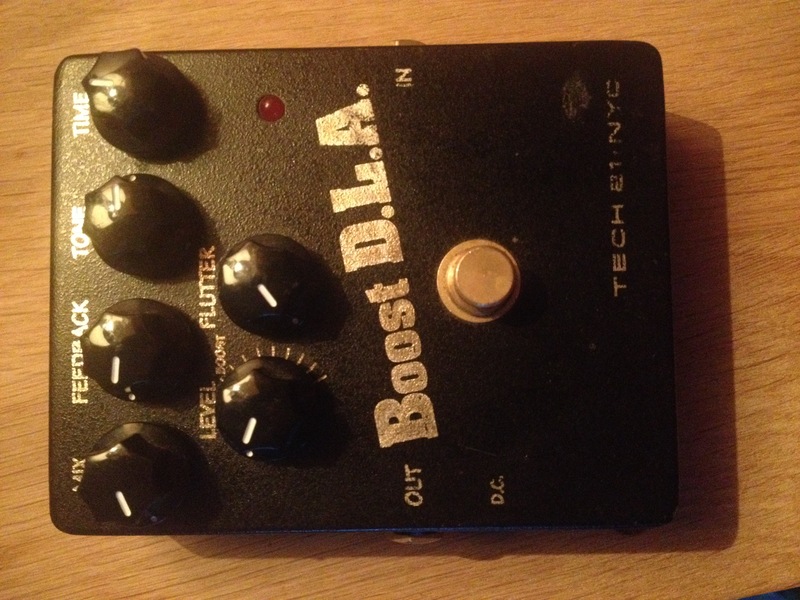 Before I had the DLA I had to engage the delay and boost separately so either the boost was later than the first note of the solo or the delay was late, this pedal solves this problem and saves space on my board to boot. The soft switch is great and allows the pedal to be turned on and off seamlessly without the dreaded click coming through your amp like you get from some pedals. The pedal is built like a brick so I have no issues with using it live and I do so all the time with no problems whatsoever. The layout of the pedal is straightforward and the knobs are not in a position where they will be bumped easily by your foot when you engage it, but they also are very easy to bend over and tweak if needed. It gives you several options for changing the delay sound and more boost than you’ll need to cut through the mix. This pedal just sounds great. It’s fairly simple to use and the warmth of the delays is great. I roll off a little of the tone and get a nice analog sound, but you can crank the tone and get a crisp digital sounding delay if that is what you are after. There is plenty of delay on tap for every application that I’ve used it for (slapback, rhythm, solos) but I guess some people out there may need more than 1000 ms of delay for some reason. I’ve never felt the need to even max the pedal in that department though. The boost is great and doesn’t really color you base tone, it just increases the volume as it should. I use my pedal in the effects loop and that gives me more of a volume boost than a gritty gain boost like it would in front of the amp. The “Flutter” control sounds nice for atmospheric textures, but I generally don’t use it for solos unless I want something a little different, I like an unmodulated tone, but it’s there if I ever feel the need to pull out some Pink Floyd tones. Overall this is a great pedal for certain applications. It makes a great solo tool to boost your overall volume and add some dimension and space in your solos. I play in a three piece so this really helps fill the gap when I drop from rhythm playing into a solo. The modulation is nice, though I rarely use it. I would buy this pedal again, but I would probably go for the newest version of the pedal. It adds a tap tempo and triplet button, which honestly I probably wouldn’t use, but if also adds a trails button which is the only thing I’d add to the original. The only thing I don’t like about the V1 is the cutoff of the delays. I think you can get a delay that has these tones for less money, but I have yet to see one that also incorporates the boost for less. 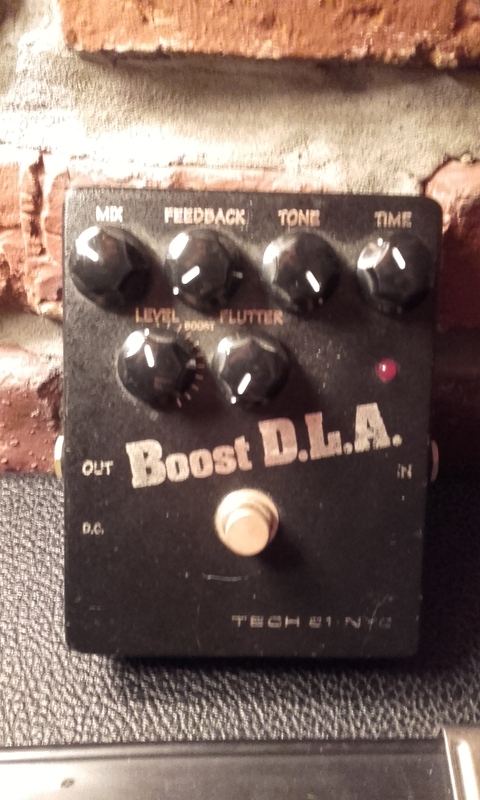 If you think you’ll use both the boost and delay as I do on solos, then grab this pedal. If you want delay and boost separate you have to look somewhere else. plus2guitare's review (This content has been automatically translated from French)" Great time ... but not that time!" Format pedal medium size, excellent finishes, building tank. The manual gives good examples that provide the basis for experimentation. It is a pleasure in its own right but to leave in search of sound settings, it sometimes falls on improbable mix yet "music." It is anything but "fast food" type preset digital, smooth and always the same. Used fxloop, telecaster guitar and a quarter cash. Cohabitation with OD wampler (plexidrive and black65) and a Line 6 MM4 modulation and a compressor Celmo Sardine Can. Used in effects loop on an H & K Statesman EL84, I love the slap back to the kind Echoplex rock'ab Gene Vincent, Eddie Cochrane or Elvis, it's like a vintage vinyl! This kills! Sounds like the memory man with U2, Curt Cobain, are realistic too, but since it is less my style of music, I'm a bad judge. The classic good time to highlight a solo (with a beautiful shine and space) with the boost to get out of the mix, it is nickel in live situations. Planing to Pink Floyd sounds are also a great success of this DLA, I used a lot, it is a drug. The final sounds are rather organic and silky, it can, if we want to simulate a nice signal degradation, although vintage ..
As the buttons are interactive, the variations are numerous. This is a "PRO" tool, which gives me a great personality in my sound construction. After years of use, I still find unusual settings with combinations effects guitar amp that new exiting. It's still music even if we can transfer very "psychedelic" with the chorus. The overall sound is characteristic of "vintage analog warmth"
Very good Q / R ratio in addition secondhand, it's cheap. I repeat that choice because it is now an integral part of my sound. I sold the RGB (need tunes!) But I miss a lot, too aveit a big personality.